Vans has always been our goes-with-everything sneaker brand. 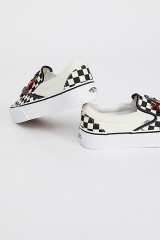 Its classic silhouettes and huge range of patterns has kept them timeless and relevant for over 50 years, but the Vans x Lirika Matoshi Slip On is the superb sneaker of our crown jewel dreams. 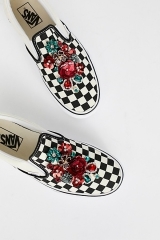 The iconic checkerboard canvas is embellished with glitzy sequins and gems in a stunning floral arrangement. 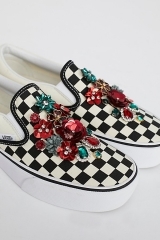 We’ve been obsessed with NY-based designer Lirika Matoshi delicately embellished tights and socks but now can with her latest mashup with Vans we get the best of both worlds. 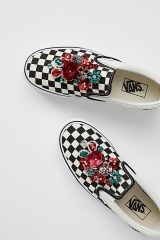 The Vans x Lirika Matoshi glimmering masterpieces are available in both regular and platform iterations exclusively at Free People – $220 USD.